This formal dress is beautiful! You cannot miss out on this Hunter Green Lace Top Maxi Dress with Side Slit. It features beautiful lace top, side slit and fits like a dream. Marisa P. Reviewed by Marisa P.
This dress was perfect for the November wedding I just attended. Shipping was quick so I wasn’t even stressed. I received SO MANY compliments. The fit was perfect and the material was light. I personally wouldn’t have had such a high slit but at the end of the night I wouldn’t have worn anything else. 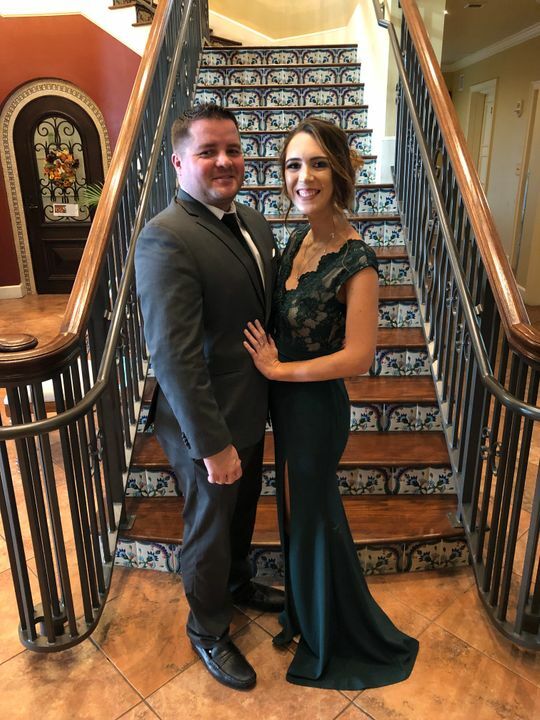 Kristen C. Reviewed by Kristen C.
I have been buying dresses from saved by the dress for the past year and have like 10 dresses from them. They are al great products, they fit well, the quality is good and this specific green one made me look amazing. I’m a medium sized girl and it hid my flaws and exemplified my good features well! Will continue to buy products!